When you look at the fish from both sides, it is green – oops then it is brown. How does he do that? He doesn’t , mother nature does. This piece of Brazilian soapstone makes up the base and the whole fish. The glorious other side of this piece (which you will have to check out the store pages to see) is a golden brown. Turn the fish, different look. Two fish for the price of one. How this carving came about was that I was on a tear for awhile making fish art for a a client that wanted his own jumping salmon, going fishing with a buddy and dreaming about all thinks wet and slimy. I think it paid off with this carving. A very realistic nature rendition if I do say so myself . And with the clear lacquer just the right touch of shiny as he just jumped out from the stream. If I was dreaming of making more art – which I usually am , it would be to create a separate bear piece reaching in for the fish. I have done this before as one piece but if it was 2 pieces the bear would have to be about 2 ft tall in order to get the correct perspective. Do have a mantle that big? Or a desk in your office? I could make it. And come to think of it , I have carved a large bear or two. Hmmm. I am always thinking of the next project. This might be it. Now to come up with a big enough piece of stone…. Keep doing what you love and 2018 will be awesome!!! I posted this photo yesterday on Facebook, Twitter and Instagram. My name for this carving is; C. Farley A Fat Bear in A Little Boat. I loved Chris Farley’s humour and I Still do even though he passed away 20 years ago yesterday. Can that really be true? It seems too long ago. I still watch his road trip movie ; Tommy Boy whenever it comes on and of course old SNL skits. Humour is a basic need in life. Like friendships, humour is that something that makes a bad day better and a great day awesome. Injecting some humor into my carvings I believe shows that soapstone art can be anything the carver makes it. An aggressive eagle, the tree of peace or this fat bear in a little boat. I believe in art reflecting the artist and his or her interests. This piece of art does that. Talking technically for a moment, I made the paddle and for someone with large size hands that was a feat in itself.. The boat and the bear are all one piece of Brazilian soapstone. This piece of art makes me smile every time I see it just like the real Chris Farley made me smile. One day someone will feel the same and buy it for their mantle or office and smile. Enjoy your life, enjoy the upcoming holidays and buy art!! I guess I was doing alot of that when you look at the carvings I have posted here. Asian soapstone tends to come in the softer colours; white, shades of pink and it is very soft compared with black soapstone. That makes it more fragile to work with at any moment this carver could accidentally chop off a piece of stone meant to be a paw or a head. That’s the beauty of art, one minute it’s here and the next maybe not. The number one favourite of the carvings pictured here seems to be the whale. This is my only whale (get it while you can) and I am not sure why I carved it other than I was carving penguins and watching alot of National Geographic. The pink colour of the soapstone lends itself to a depth that is surprising when you see it up close and with the fluid nature of a whale body and tail the colour works wonderfully. The pink bears give a totally different look , maybe closer along the lines of seeing pink elephants. They make people smile and want to rub the bears’ heads. On my shop pages you will see; Asian, Brazilian and Canadian soapstone and the range of colours that I have worked with. As a Canadian carver working in stone from other places, it is very satisfying to see the art come together. And of course, I love to carve stone wherever it’s from. If you would like to commission me to carve something for you or want to buy something in the shop just head to the contact page or the cart and we can make your day. To own a Johdan Stone Art carving is have your favourite present right at the time of the year that people are in good cheer. This is a shameless plug to support your local artist and if I am not local to you just pretend we are , since we are only a click away. What if my favourite carving has been sold. Well, I have an answer for that. All is not lost I do work with people on commissions. This has come up a few times since I have been posting on Instagram and I am so happy people are enjoying my carvings, now if they would only ask for one of their own to take home and admire in person. Every carving is unique and that is the beauty of art. The eye of the beholder, a different…. for every seat. You get the idea. This holds so true if you love something I have already done, I could never duplicate a work, each stone is different and I am different from day to day but I can work with you. The latest commission was a squirrel and I almost loved the research and picking the stone as much as the customer loved the finished carving. Check out my shop pages but don’t be shy about asking for more , more and more. My wife will thank you for keeping me busy and I never have enough time in the carving shed. Happy carver, happy bears or something like that. Not only do most of my dancing bears make people smile which is a nice feeling when people enjoy your art. But, I enjoy doing the math that goes into making bears dance . Yes, strange as it sounds, I love to carve dancing bears because of the math. It takes one thirty secondth of an inch out to make a dancing bear a bear who can’t stand on one foot. Measure, have patience and do the math to make a bear that can balance on any flat surface. The mechanic in me loves the math. The artist in me loves to figure out which way the head is coming out of the rock, should the paw be up or down or both. Some bears just gotta dance. I have carved ; aggressive bears, stalking bears, fishing bears but the dancing bears are just joyful no matter what I think they may start out like. Sometimes they are very traditional – no breaking dancing, or waving to the crowd but even those bears are never scary bears. It says something about the carver I guess. I have a long fuse and you probably wouldn’t want to have me behind you on a racetrack because I wouldn’t be there if I didn’t want to win but other wise, a happy carver makes happy bears. Dancing bears that is. A bear in motion stays in motion. At least when this bear, (he or she) is immortalized in stone. This carving was given the name ‘Phelps’, (You might be able to figure out when I was carving it and it wasn’t during Shark Week) and will forever be in motion. Swimming , doing the front crawl is a totally different activity than a dancing bear . A dancing bear is vertical and not horizontal but also, dancing requires the balance of one small foot. How many swimming stone bears are out in the world? I am not sure. I do know that, swimming bears are not classic soapstone carving models . This works on multiple levels as , I am not a classic soapstone carver either . The motion of moving through the water is captured by the position of the paws but the abstraction of the back paws frees up the viewer to realize that he is not moving through the forest. Also, the Brazilian soapstone colours add to the sense of depth of this bear. The sleekness of the clear Kote, the colour of the stone and the motion captured. You know you want to touch it. Love it when a carving comes together. I haven’t felt the urge to carve another swimming bear since Phelps. There is only one. As for carving bears in motion however, I am 99% sure I will keep carving those. Please check out my shop pages for all sorts of art that may interest you to take home. Just like seeing things in clouds, I see things in rocks. 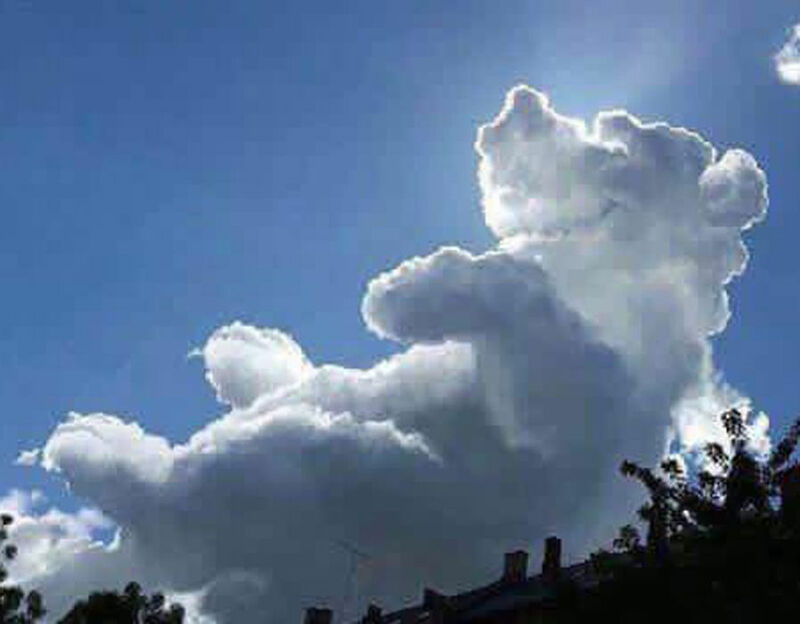 This cloud is pretty blatantly a bear. Maybe Winnie the pooh? He seems pretty smiley and happy. But, people have also seen things in grilled cheese, water stains , green mold on cold cuts. Because of the number of ‘sightings’ in all forms of materials, I don’t think I am alone in thinking there is more to a rock than just a rock. What I see in the stone has to be brought out and maybe that’s the difference to the examples I sited already. I peel back the layers and the little rough spots so that other people can see the bear, or the eagle or the the collage that I see. Check out my shop pages if you would like to see more of what I see stones. Carving boulders into bears. Whether the pieces of art sell or not, well that as always is up to the client. If I can have a sense of humour about my art most of the time, that is what I can control. Pictured here is a spring chicken. I entered myself in a contest a few years ago which in our circles is called; a juried exhibition. Sounds quite a bit more professional and fancy to be juried and exhibited instead of shown. Do dog shows have juried exhibitions? Just wondering? Either way, I think you are supposed to feel better when you get in and worse when you don’t. This spring spring chicken bit of tongue in cheek humour made me smile and didn’t get in. I think the criteria for the exhibition through the gallery that operated it was; the change of seasons . That is pretty all encompassing and could have taken anything from my art world including a collage of nature . I however veered towards humour. This whole carving is solid but I am pretty proud that the old bird looks like he is teetering on the moment of springing off to head for some worms. Do I wish that I won the contest, of course- winning is the only thing. But I laughed and humour is an important thing. There is everything wonderful about traditional or classic art. In the case of my art, this black Canadian soapstone grizzly. The stone used for this grizzly is from Northern Quebec, the carver (me, is from Southern Ontario) . The inspiration is simple; well fed grizzly in nature. This guy is on the move and not ready for hibernation yet but, you can tell he must have had a successfully hunting season. He doesn’t look particularly aggressive , I would say more majestic. With the big head and limbs he is begging to be touched by onlookers and at least this bear won’t bite. I would have to say that there is a depth to this black stone even though you can’t see it in photos. There are some places in the rock that are darker than others, little natural lines in the stones that are not cracks.. The challenge with black soapstone as opposed to Brazilian, Asian or Indiana pipestone if there is one, black stone is very hard. Think granite. Not very forgiving and requires very sharp tools. From a technical finishing point of view, he’s shiny because he has the protection of yes… wait for it… Clear Kote. The protection every stone bear needs from dings and things that might happen when he is shown out in public. As with any art or boy scout – be prepared. It’s worth the effort to carve just the right bear with just the right attitude and it will speak to just the right client. Sometimes it might be hard to give up a favourite piece but, when if this does happens, I go ahead and put the bear in inventory and price it , still consider it mine until sold (not usually at an outside gallery but on show in my home gallery) This works for everyone I think. Please visit the shop to see more of my finished work, and thank you for coming by.